Assemblyman Jeff Gorell (R-Camarillo) will be promoted to the rank of Commander (O-5) in the United States Navy (Reserve Component) at a ceremony on Friday, June 20 just outside Naval Base Ventura County. Commander-select Gorell, an intelligence officer and third-generation navy veteran, was selected for promotion last year by the Navy’s annual Commander (O-5) promotion board. Cmdr. Gorell’s military service was previously highlighted in 2011 when he became the first sitting member of the California State Legislature to be called to active military service since World War II. Half of his first two-year term was spent on an unpaid leave of absence from the legislature while he was embedded as a targeting officer with the U.S. Marines at Camp Leatherneck in Afghanistan. He earned the Defense Meritorious Service Medal for leadership in a combat zone. The ceremony will occur at the U.S. Navy Seabee Museum at Naval Base Ventura County in Port Hueneme, and will be officiated by senior Navy officers in his chain of command. Since 2009, Commander Gorell has served as executive officer of NR STRATCOM JFCC SPACE, a reserve unit that supports military joint space operations. SACRAMENTO – Board of Equalization Member George Runner will host a telephone townhall for California’s manufacturers on Tuesday, July 1 at 10:00 a.m. The free event, co-hosted by the California Manufacturers and Technology Association, will provide information on tax issues specific to the manufacturing industry, including the new manufacturing sales tax exemption that takes effect July 1, 2014. THOUSAND OAKS, CA - The citizen-designed redistricting plan for the Ventura County supervisorial districts has brought fairer representation, according to a study by a California Lutheran University professor published June 19 by SAGE Open, an open-access journal by SAGE Publications. Gregory Freeland, chairman of the Department of Political Science, compared Ventura County supervisors’ decisions to their constituents’ votes on state propositions and local measures and interviewed politicians and community activists to draw conclusions that could have implications for other redistricting efforts. The 2000 census showed that representation for different cities on the Ventura County Board of Supervisors did not reflect changes in population. Rather than relying on political staffs and consultants to redraw supervisorial districts to make the electoral process more representative, the board in an unusual move delegated the job to a citizen task force. Supervisors approved the new districts in 2001. Freeland’s report, “Community Members Draw the Line: Redistricting by a Ventura County Task Force,” shows that supervisors were elected or re-elected to office based on their responsiveness to their constituents’ concerns after the plan went into effect. Most of the incumbent supervisors were re-elected, but a notable defeat occurred in the predominantly Latino District 5 covering most of Oxnard, where previously unbeatable John Flynn lost to John Zaragoza in 2008. In addition, the district’s voter turnout has improved and nonprofit leaders and activists report increased responsiveness from officials since the redistricting. The addition of the Ojai Valley strengthened an already solid base of support for environmental protections and liberal social policies in District 1, which also includes Ventura, according to Freeland. Environmentalist Steve Bennett won 76 percent of the vote in 2004 and ran unopposed four years later. According to Freeland’s research, supervisors’ stands on issues such as environmental policy, education and campaign finance generally aligned with the opinions of the majority of the residents of their districts. For instance, a proposition dealing with clean water and air and coastal protection passed 61 to 39 percent in Bennett’s district in 2002. The proposition failed only in District 4, which includes Simi Valley and Moorpark and is represented by Peter Foy, who voted against a bill by Bennett to allow homeowners to borrow money from the county to invest in environmentally friendly energy systems. SAGE Open can be found online at http://sgo.sagepub.com/latest. “Legislators can congratulate themselves on approving an on-time budget. Although this budget contains large spending increases, thankfully it does not raise taxes. “What’s missing is the broad-based tax relief we need to spur jobs and stimulate growth across our entire economy. “In addition, the Legislature missed yet another opportunity to defund the bullet train and eliminate the fire tax. SACRAMENTO – In the wake of the Budget Conference Committee voting Thursday to reject the restoration of Medi-Cal provider rates, Assembly Budget Committee Vice-Chair Jeff Gorell (R-Camarillo) and Assembly Republican Leader Connie Conway (R-Tulare) today sent a letter to Governor Jerry Brown, Senate President Pro Tem Darrell Steinberg and Speaker Toni Atkins urging them to reconsider this action and restore efforts to raise reimbursement rates. The refusal to raise the Medi-Cal provider reimbursement rate is considered surprising since both the Senate and the Assembly had previously proposed restoration of the provider rate, and there has been bipartisan support for the restoration. The Senate proposed restoring the Medi-Cal provider-rate reduction prospectively for most providers starting July 1, 2014. The Assembly proposed to forgive retroactive payment reductions starting July 1, 2014, and eliminate the rate reduction for all providers starting April 1, 2015. Sacramento, CA – Assembly Budget Vice-Chair Jeff Gorell (R-Camarillo) today voted against a state budget proposed by Governor Brown and legislative Democrats which increases state spending to a record level, undercuts local control of schools, and contains a number of legally questionable practices including the use of cap and trade funds to pay for high speed rail and locking in long-term spending increases. While the final budget relies on the Governor’s more realistic revenue estimates, total spending will grow by $12 billion to a record $108 billion. The budget regrettably sets the state up for significant future spending obligations, such as the proposal to increase welfare grants by five percent starting next year. It also spends money on pet projects, such as $2.7 million for a new swimming pool in Calexico and $2.5 million to remodel the old Governor’s Mansion. On K-12 education, the Democrat budget will cap school district reserves – which could push many districts into bankruptcy and make it less likely that those students in low-performing schools will learn from a quality teacher. In 2009, school districts that had strong reserves were able to avoid devastating cuts. With their reserves now limited by this budget, they may not have enough money to stave off cuts in future economic downturns. The budget also fails to fulfill the promise of Proposition 30, which California voters approved in 2012 to protect education. The budget uses the higher taxes from Proposition 30 that would have gone to higher education to fund social services instead. Furthermore, the budget rejects a bipartisan request to increase funding for the California State University by $95 million. Sacramento, CA – Citing the past decade of recurring tuition and fee increases in the CSU and UC systems that have increasingly pushed the costs of a college education out of reach of disadvantaged students, Assemblyman Jeff Gorell (R-Camarillo) today announced his disappointment over the continued underfunding of the California State University budget after the bicameral budget conference committee voted tonight 6-2 to abandon efforts to augment appropriations to the California State University system. Assemblyman Gorell circulated a bipartisan letter to express support to the Governor and legislative leadership advocating an increase of $95 million over Governor Brown’s level of funding sought by the CSU system to increase access. The letter was signed by 33 members of the legislature. Half of California’s new teachers come from the CSU system, along with half of our engineering graduates. In high demand career fields such as agriculture, criminal justice, public administration and business the California State University system awards more Bachelor’s degrees than all other universities in the state combined. A study by the Public Policy Institute of California (PPIC) in 2012 found that during the recession the UC and CSU enrollment rates have fallen by one fifth, pinning the blame firmly on the increased tuition and fees at these campuses caused by the state’s underfunding of higher education. The PPIC study additionally projected that California will end up falling one million college graduates short of the state’s economic needs by 2025 unless these enrollment and graduation rates improve. Camarillo, CA - Veteran of the War in Afghanistan and 26th Congressional District Candidate Jeff Gorell today called for bi-partisan action to end disgraceful bureaucratic incompetence that has cost the lives of at least 40 military veterans at VA medical facilities. "America's veterans deserve better treatment than they are receiving from the VA and this Administration. That's why I strongly support the legislation being proposed by House Veterans Committee Chairman Jeff Miller (R-Florida) which will guarantee that any Veteran who has to wait more than 30 days for an appointment at a VA clinic or hospital can seek outside care at the department's expense," stated Gorell. "I call upon Julia Brownley to join me in supporting this common sense proposal to give our Veterans the quality medical treatment that they have earned," continued Gorell. "It's time for action, not empty rhetoric to get this issue resolved." SACRAMENTO – A George Runner-sponsored proposal to protect California’s disabled veterans cleared the Senate this week with unanimous, bipartisan support. Senate Bill 1113, authored by Senator Steve Knight (R-Antelope Valley), would help ensure that disabled veterans who encounter bureaucratic delays can still claim a key property tax exemption. “Disabled veterans should not miss out on tax benefits to which they are entitled just because the federal government, for whatever reason, is unable to give them their 100% disability rating in a timely manner,” said Runner. The full Board of Equalization voted to support SB 1113 at its March 25 meeting, and the measure has also received support from the California Assessors’ Association, California Taxpayers Association, Howard Jarvis Taxpayers Association and a broad coalition of veterans’ organizations. Sacramento, CA – Legislation giving California’s military bases the ability to invest in cleaner renewable energy sources such as solar and wind power was approved today on the Assembly floor in a bipartisan vote. Assembly Bill 2649, co-authored by Assemblyman Jeff Gorell (R-Camarillo) will allow military bases to surpass the current one megawatt limit for uploading excess electricity from renewable sources to state’s utility grid. The one megawatt limit has been cited as a major reason preventing California military bases from investing in renewable energy. In current California law, military bases are considered a “single location or premises”, limiting their ability to generate renewable energy like solar and wind power to only 1 megawatt, a small fraction of the actual power needs of a modern military base. Jeff Gorell, candidate for Congress (CA-26), will be hosting an election night results party at 7:00 PM on Tuesday, June 3 at the Gorell Campaign headquarters. For more information, please contact the campaign at (805) 910-7121 or visit www.jeffgorell.org. "As a proud third generation war veteran and member of the Naval Reserve, I am appalled by the daily stories coming out of the Veterans Administration. To treat those who have given so much to protect our freedom so poorly - with such little humanity and even basic consideration is wholly unacceptable. The President should immediately relieve Secretary Shinseki of his duties and begin the process of repairing what is so clearly a broken system and apologize to the millions of veterans who rely on the VA for their basic medical service. They earned our gratitude and they earned the right to the best care we can provide. Right now we're giving them neither, and that is both shameful and unacceptable." SACRAMENTO – George Runner today released security camera footage [view video] showing a pedestrian nearly struck by falling glass in a January 2012 incident at the Board of Equalization’s downtown Sacramento high-rise. Runner also called on Governor Jerry Brown to back an effort to move the Board of Equalization out of its problem-plagued headquarters in downtown Sacramento. Located in Runner’s district, the 24-story headquarters building at 450 N Street is designed to house 2,200 employees, while BOE requires space for 3,150 employees in order to carry out the legislative mandates for revenue administration, collection and enforcement efforts. To address these overcrowding concerns, approximately 700 employees and more than one million taxpayer records have been relocated to four annex facilities, disjointing staff, disrupting business functions and increasing operational costs. Additionally, since moving into the building in 1993, the state has spent approximately $59 million on remediation and modernization costs—an unusually high amount for a building of its age. Unfortunately, the state could be forced to spend in excess of $40 million over the next few years to address outstanding projects including the replacement of 2,070 spandrel glass panels ($7M), the replacement of waste water pipes ($10M), and the cleaning of mold from HVAC ducts. Runner is supporting legislation (AB 1656) by Assemblyman Roger Dickinson to authorize a new consolidated Board of Equalization headquarters. Runner co-authored a similar measure (AB 151) in 2010 that was vetoed by Governor Schwarzenegger due to the state’s fiscal condition at the time. A Runner-backed state audit is in progress and aims to determine the best approach to address problems with the Board of Equalization’s headquarters. A report is expected by the fall. 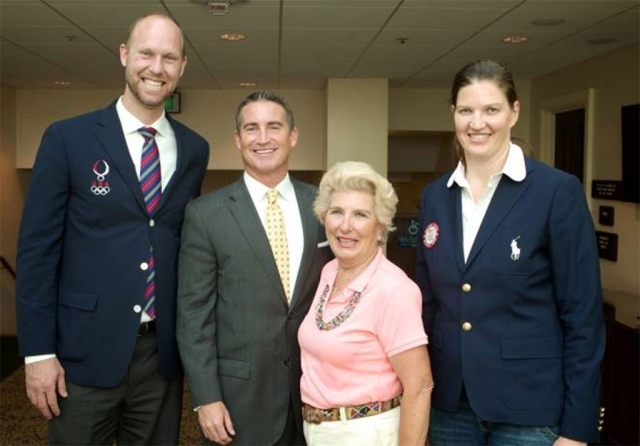 (l-r) Gabe Gardner, 2008 Olympic Gold Medalist in Volleyball; Assemblyman Jeff Gorell; Starr Walton Hurley, 1960 Winter Olympian; Stephanie Brown Trafton, 2008 Olympic Gold Medalist in Track and Field. Sacramento, CA – Legislation to exempt gold, silver, and bronze Olympic medalists from paying taxes on those achievements today passed out of the Assembly Revenue and Taxation Committee on a bipartisan vote. Assembly Bill 2323 by Assemblyman Jeff Gorell (R-Camarillo) would exempt California Olympians and Paralympians from state taxes on awards by the U.S. Olympic Committee (USOC) for their success in the Olympic and Paralympic Games. The exemption does not include sponsorship deals and other endorsement income. In addition to the physical medal earned by Olympic and Paralympic athletes finishing first, second, or third in their respective events, the USOC, which receives no regular government funding, provides honoraria to medaling athletes. Athletes are generally awarded $25,000 for a gold medal, $15,000 for silver, and $10,000 for bronze. This amount, in addition to the value of the medal itself, is fully taxable. In 2012, some bronze medalists were levied a tax of $3,500, silver medalists a tax of $5,385, and gold medalists a tax of $8,986. Most American Olympians and Paralympians are amateur athletes with modest incomes, earning nothing for Olympic and Paralympic competition. For instance, only half of the country’s track and field athletes ranked in the top ten in the nation make more than $15,000 a year from the sport. This bill will provide tax relief to California’s medalists, many of whom have made enormous sacrifices in pursuit of Olympic success. “The Governor is on the right track in proposing a budget that has no new taxes, contains ongoing expenses, pays down debt and begins to address the state’s growing pension costs. “I just wish the Governor would repeal the fire tax and stop the bullet train. “In addition, California continues to rank as the worst state to do business in an annual survey of business leaders. Camarillo, CA – Working with Ventura County Animal Services and the Humane Society of the United States, Assemblyman Jeff Gorell (R-Camarillo) today announced that they were able to find permanent homes for 100 shelter pets to reduce critical overcrowding in Ventura County shelters in Camarillo and Simi Valley. Last week Assemblyman Gorell announced that he would cover the adoption fees for the next 100 pets adopted from the shelter. The program was met with overwhelming response. A caring community poured its heart out and all 100 pets were adopted in less than 5 days. Assemblyman Gorell also encourages everyone to support Assembly Bill 2326, which will allow people to receive a state income tax deduction for pet adoption fees. Camarillo, CA – Assemblyman Jeff Gorell (R-Camarillo) will be joining representatives from The Humane Society of the United States at the Ventura County Animal Shelter in Camarillo to promote the adoption of animals from the shelter. Assemblyman Gorell will be live tweeting and posting to Facebook with photos and information about the great pets currently available for adoption. Assemblyman Gorell has also joined with The Humane Society of the United States to cover all adoption fees for the first 100 people to adopt pets from the Ventura County Animal Shelter. The adoption drive will be followed on Twitter and Facebook with the hashtag #Gorell100. Help us save some animals by making one part of your family today, and do so Fee-Free! The Ventura County Star recently reported recently that the Ventura County Animal Shelters are nearly at capacity, and usually expect a greater number of incoming animals during the spring months. Assemblyman Jeff Gorell will be joining local community groups for “Helping Hands: A Day of Community Service” this Saturday, April 26th. The event brings together community service organizations, churches, civic groups and other community partners to help restore and beautify California. Assemblyman Gorell will be speaking to the group and participating in the Stage Coach Inn Fire Hazard Project in Newbury Park, where 100 volunteers will be working in conjunction with the Conejo Valley Historical Society to clear a section of overgrown waterway on the grounds that presents a fire hazard to the Museum. Volunteers will clear wood and brush into large waste bins. Long pants and sleeves recommended. Volunteers are to meet at the chapel on 1600 Erbes Rd, Thousand Oaks, CA for instructions and directions no later than 7:30AM. Many hands make labor light! All volunteers welcome. Come protect and preserve a little piece of our local history! This annual event began in 1998, when leaders of The Church of Jesus Christ of Latter-day Saints asked local South American Church leaders to reach out to their communities through service. Responding to the call, leaders set out to establish an annual Day of Service. Today, similar Mormon Helping Hands “Day of Service” projects are organized in every corner of the globe. Hundreds of thousands of members and friends of the Church participate. SACRAMENTO, CA – A George Runner proposal to protect California’s disabled veterans won backing from a key legislative panel today, when the Senate Governance and Finance Committee voted 7-0 to back SB 1113. The measure, authored by Senator Steve Knight (R-Antelope Valley), would help ensure that disabled veterans who encounter bureaucratic delays can still claim a key property tax exemption. The measure also won unanimous support from the Senate Veterans Committee at its April 8 hearing. In addition, the full Board of Equalization voted to sponsor SB 1113 at its March 25 meeting, and the measure has also received support from the California Assessors’ Association, California Taxpayers Association and Howard Jarvis Taxpayers Association. Assemblyman Jeff Gorell will be continuing his series of “Sidewalk Office Hours” where he looks forward to meeting with constituents and discussing their concerns. Informational material will be provided and a constituent affairs representative will be available to address specific concerns about working with state and local agencies.